A 17-year-old boy called Nenous Thabit is fighting the war against ISIS in an incredibly unique way. Thabit is RECREATING sculptures and artifacts that were destroyed when the Islam extremist group destroyed most of Nimrud. Most of the historic monuments—including countless artifacts—were destroyed as the Islamic extremist group destroyed centuries-old monuments. The Islamic extremist group was on a mission to destroy symbols they considered idolatrous, hence, using sledgehammers and drills to bring destruction. But 17-year-old Nenous Thabit decided to do something about it in his own unique way. Thabit decided that the best way to retaliate was to recreate some of the items and sculptures that were destroyed in the raid. The city of Nimrud dates back around 3,000 years and was once the capital of the ancient Assyrian Empire. In some of the images, the 17-year-old can be seen living in a modest home with his family, where he meticulously carves some of the statues like the beard of Lamassu, an ancient Assyrian deity which is one of his favorite. It takes around 15 days to complete a piece. However, by announcing his work, Nenous Thabit and his family are in danger. But this hasn’t stopped Nenous to continue his work bringing back that which was destroyed by terrorism. 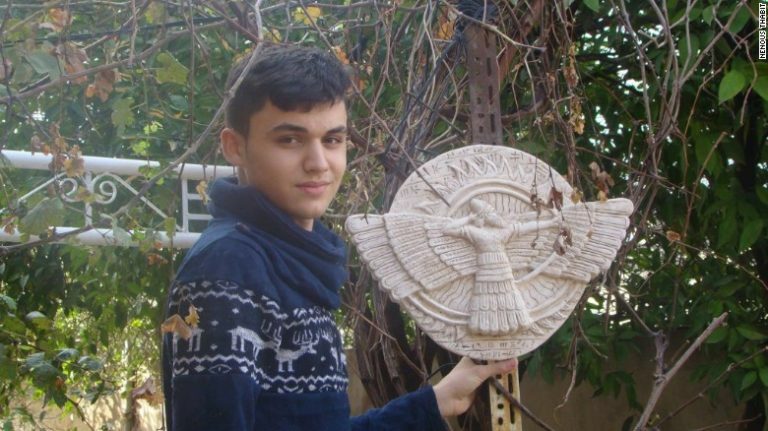 In the past year, the 17-year-old has recreated 18 ancient Assyrian statues and one mural. The young boy inherited the talent from his father, who is a sculpturer himself. “Nenous is an incredibly fast learner. I see huge potentials in him,” said Thabit Michael, the father of the boy. Interestingly, until ISIS began destroying precious historic artifacts sculpting was only a hobby for the 17-year-old. “My dream is to become a prominent artist in Iraq to make my country proud and show the world that we in Iraq love life and cherish our heritage,” said the boy in a telephone interview with CNN. Ian Somerhalder's Advocacy: Save the Pangolin!